Welcome to the LiteMage Showcase! This is a series of blog posts where we take a look at Magento site owners using LiteSpeed Web Server + LiteMage Cache and highlight how LiteMage has uniquely benefited them. This week we are featuring Rafasshop, a Spain-based business specializing in providing wholesalers with t-shirts, polo shirts, sweatshirts, and many other customize-able textile products. 3rd Party Extensions: LiteMage Cache, multiplecart with colorswatch, t-shirt designer, many extensions from Amasty, Extensionsmall, Fooman, M2E Pro, Mageworx, Mirasvit, Templates Master, Webcooking, Webshopapps, etc. With a multi-store/multi-domain/multi-language setup, customer group and tier prices, configurable products with many attributes, and many basic to advanced custom extensions, Rafasshop is definitely a very complex store. Their heaviest customization consisted of showing their customers information on a configurable product page while pre-loading the information and images of all related simple products and their different stocks and arrival dates. Some of these configurable products have more than 150 simple products associated with them, all needing to be pre-loaded. To support this level of customization, a large amount of CPU resources needed to be used any time a customer loaded a product page. Default settings support heavily customized Magento setups. Works out-of-the-box! 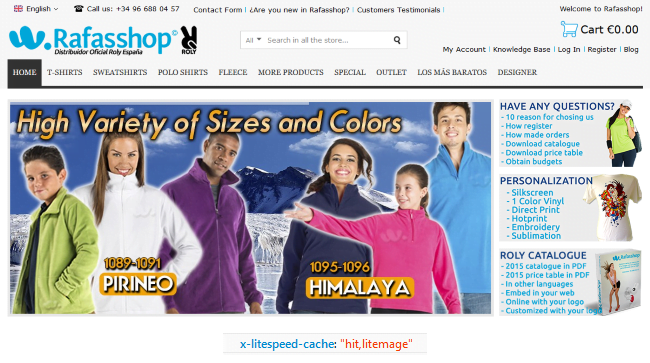 Rafasshop were happy to find that, contrary to their past experience testing other caches with their highly complex site, LiteMage worked for them out-of-the-box without the need for any manual configuration. With LiteSpeed + LiteMage, they were able to severely cut down on hardware costs while still seeing load times much faster than previously possible! We also plan to add more configuration options to LiteMage’s built-in crawler that we think will further enhance Rafasshop’s cache warm-up process.